The 6th-century basilica of Sant'Apollinare in Classe is located in Classe, the small harbor town of Ravenna located about 4 miles south of the city center. Like most Ravenna churches, it is known for its exceptional Byzantine mosaics. It also has elegant architecture and a fine collection of early Christian sarcophagi. The Basilica of Sant'Apollinare is dedicated to St. Apollinaris, patron saint of Ravenna. His dates have been difficult to determine, but he is said to have arrived at the port of Classis and converted the local population, which consisted mainly of merchants and sailors. Most estimates put his lifetime in the late 2nd century. Around 532 AD, Bishop Ursicinus began construction on a church in honor of St. Apollinaris next to a Christian burial ground in Classe. It was consecrated by Bishop Maximian on May 9, 549. Like the Basilica di San Vitale in the city center, the building was financed by Julianus Argentarius. The same long, thin red bricks are common to both structures. A few changes and additions were made over the centuries. The clerestory was repaired in the 8th century; the apse was raised to allow for a new crypt underneath in the 9th century; and the round bell tower was added in the 10th century. Later, the precious marble revetments of the walls were taken away to decorate the church at Rimini (15th century) and paintings were added to the nave walls (18th century). At some point the basilica lost its atrium (west courtyard). The basilica has a very spacious nave with side aisles. 58 wide windows, including five in the apse, flood the interior with light. The nave is supported on two dozen slender marble columns topped with Byzantine carved capitals. These are not ancient spoils, but a perfectly matched set made specifically for the church in the imperial workshop of Proconnesos. The beautiful capitals are known as the "butterfly" or "leaves blown by the wind" type. Originally the nave walls and clerestory were covered in mosaics (as can still be seen at Sant'Apollinare Nuovo) but these have all disappeared. The lower part of the wall and the spandrels of the arches are now decorated with frescoes and stucco of the 18th century. The fresco medallions depict bishops of Ravenna. The floor of the interior was also entirely paved in mosaic, but only a bit of the ancient pavement survives at the back of the right aisle. It includes a partial inscription noting that the work was sponsored by Gautentia and Felix. Above it is a marble altar canopy, with an inscription dating it to the early 9th century. Another mosaic fragment, found in 1953, is displayed on the right aisle wall behind glass. The west end of the basilica is fronted by a narthex, which contains the small ticket kiosk and some artifacts found in the area. The east end has a large central apse, which is round inside but polygonal outside, flanked by two square chapels known as the prothesis and diaconicon, respectively. The side chapels have small pentagonal apses. The chapel on the right was hosting a baptism during our visit. The main highlight of Sant'Apollinare in Classe is certainly the glittering mosaics of the presbytery, apse and triumphal arch, which range in date from the 6th to 12th centuries, mostly the former. The apse mosaic dates from the 6th century and depicts two scenes that blend into each other. At the top is an interestingly symbolic depiction of the Transfiguration (Matthew 17:1-9, Mark 9:2-8, Luke 9:28-36). Christ is represented by a golden cross on a starry blue background, while the three apostles who were present at the Transfiguration - Peter, James and John - are represented by lambs. Flanking the cross against a backdrop of golden skies and sunset-tinged clouds are figurative depictions of Moses and Elijah, labeled with their names. The large cross is decorated with mosaic gems and a bust of Christ in the center. It has a Latin inscription at its base reading SALVS MVNDI, "Salvation of the World" and a Greek inscription at the top: IXΘYC. This means "fish" in Greek and is also an anagram of the names of Christ: Jesus Christ Son of God Savior." Below this scene is the namesake of the basilica, St. Apollinaris, labeled with the inscription SANCTVS APOLENARIS. He wears a white dalmatic and purple tunic, the latter embroidered with bees to symbolize eloquence. He is shown in prayer, interceding on behalf of his flock who are represented below by lambs. This is the first known example of choosing a subject other than Christ in Majesty for the apse decoration. Around the saint is a soft green backdrop populated with rocks, birds, and plants. Among the greenery are pine trees, which can still be seen growing outside the church. The back wall of the apse between the windows bears mosaic portraits of four Ravenna bishops: Severus, Ecclesius, Ursus and Ursicinus. The mosaics on the side walls of the apse date from the 7th century. The left wall of the presbyteryshows Emperor Constantine IV Pogonatus and his brothers Heraclius and Tiberius handing the "Priviliges" to Reparatus, delegate of Bishop Maurus (671-77). The right wall shows three Old Testament figures who made sacrifices to God: Abel with his perfect lamb, Melchizadek at a table with his bread, and Abraham with his son Isaac. The theme of sacrifice is related to the Eucharist, which was performed at the high altar beneath the mosaic. The mosaics on the upper part of the triumphal arch (or choir arch) date from the 9th century. Against a dark background are the symbols of the Four Evangelists in flight, with a bust of Christ in the center. The winged ox, symbol of St. Luke, is quite unusual: rather like a Picasso painting, its head is very distorted, with the nostrils shown frontally but the rest in profile. The area below these figures shows the holy cities of Bethlehem and Jerusalem, from which twelve lambs emerge and ascend a hill toward Christ. These represent the Twelve Apostles. Below, squeezed in along the sides of the apse, are palm trees. These mosaics date from the 7th century, as do the figures of the Archangels Michael and Gabriel carrying banners. At the bottom on each side, busts of the Evangelists Matthew and (probably) Luke date from the 12th century. The walls of the side aisles are lined with magnificent examples of Early Christian sarcophagi, most of Ravenna archbishops, dating from the 5th to 8th centuries. They are decorated with some biblical scenes, but mostly feature ancient Christian symbols like the chi-rho, cross, peacock, and Alpha and Omega. One of the earliest examples is the Sarcophagus of Bishop Theodorus, which was made in the 5th century and reused for the bishop when he died in 688 AD. On the lid, which is decorated with three chi-rho reliefs, is a simple epitaph: "Here rests Theodorus, Archbishop." The main panel of the sarcophagus has a relief of a chi-rho flanked by peacocks and vines. Another tomb from the 5th century is the Sarcophagus of the Twelve Apostles. The lid is decorated with three monograms made of Xs laid across Greek crosses (+). On the main panel, Christ sits enthroned in the center and gives Paul the scroll of the Law. On his other side, Peter approaches, carrying a tall cross and his keys. Other apostles hold crowns or raise a hand in prayer. The Sarcophagus with Six Niches, dating from the 6th century, expresses the theme of the Fountain of Life. The lid is covered in a fish-scale pattern and the main relief has niches topped with shells and peacocks drinking. Guiseppe Bovini, Ravenna: Art and History (Ravenna: Longo), 95-102. 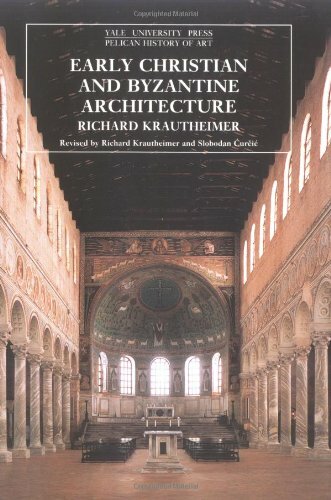 Richard Krautheimer, Early Christian and Byzantine Architecture (Yale University Press, 1986), 277-78. Below is a location map and aerial view of Sant'Apollinare in Classe. Using the buttons on the left (or the wheel on your mouse), you can zoom in for a closer look, or zoom out to get your bearings. To move around, click and drag the map with your mouse.